Picking good stocks isn't always difficult—but timing entries and exits can often be the most challenging part of trading and investing. Knowing when to buy and when to sell is as important (or more important) than knowing what to buy and what to sell. So just imagine if you had software telling you in real time that the stock market was bottoming in 2002, topping in 2007 and bottoming again in late 2008 / early 2009. Now you can stop imagining. Parallax Financial Research actually did it. Just look at the chart of the S&P 500 above--the pink overlays on the chart indicate top and bottom signals as they occurred in real time. And we do it every day, providing valuable topping and bottoming signals on virtually every financial instrument, from equity indexes and individual stocks to currencies and bonds. By applying chaos and complexity theories to real markets, we developed neural network predictors to make the complex simple. Each real-time signal is presented as a clear overlay on any chart you choose, whether it be a five-minute, hourly, daily, weekly or monthly chart. Here's a perfect example: in August 2012 when everyone was calling for Apple to hit $1,000, the Parallax software was suggesting caution. 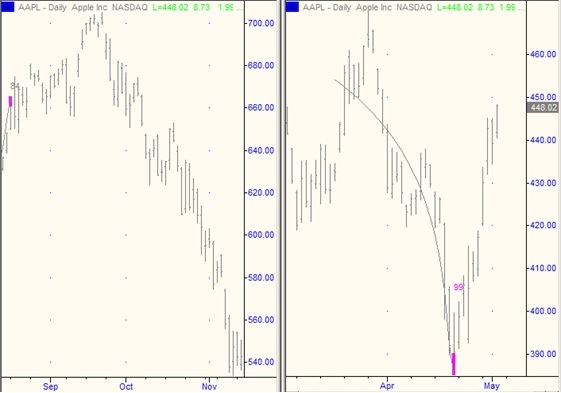 Notice the topping signal on the chart below when Apple hit $670. Yes, there was $30 of more upside, but only to be followed by more than $300 of downside. And when fear hit extremes and Apple broke below $400, the Parallax software was telling us that it was ready for a bounce. Note the bottoming signals in mid-April 2013 on the chart below when it hit $387, which directly preceded a $60 rally within a matter of days. The chart below provides a good example of the many robust features provided by the Parallax Financial Research software. ExtremeHurst attempts to identify price exhaustion by inserting pink indicators on charts. These indicators are statistically significant for 15-25 bars, but are often relevant for as many as 50 or more bars. The chart above illustrates a few price exhaustion signals on the daily chart of the Nasdaq Futures contract. The top signals in the Spring of 2012 around 2700 resulted in a 300-point drop by early June. And the bottom signals at 2450 in late May 2012 resulted in a rise of over 350 points by September. The top signal in late August 2012 resulted in a 200-point drop by November. ExtremeHurst also attempts to identify the beginning of new trends by inserting blue indicators on charts. These signals indicate that a big move is brewing and are also statistically significant for 15-25 bars, but are often relevant for as many as 50 or more bars. Straddles or strangles are very successful trading strategies to use with these signals. 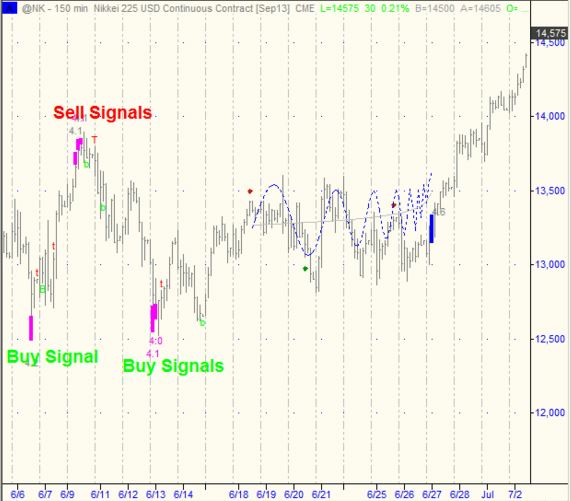 The chart above illustrates a few compression signals on the Nasdaq Futures contract. The signal in December 2011 resulted in a 500-point move by March 2012. The compression signal in July 2012 resulted in a 300-point move by September. PriceMemory displays historically significant support and resistance levels and attempts to identify when these levels will hold and when they will break. We have found that if price stops just shy of support or resistance (0.5 standard deviations for a 1-bar move with historical volatility), then for the next few bars, price has a significantly higher probability of NOT crossing over the line on a closing basis. This indicator is best used as a short term 1- to 4-bar trading tool to fade the support or resistance level. SmartChannel automatically draws channels on your charts, and adds indicators to the channel. The channel line thickness varies by the number of contacts made. The more price points that touch a line, the thicker the line is drawn. Channels are colored red for bearish channels and green for bullish ones. Channels are also rated by how volatile price is within the channel by comparing the average ranges to the same length period immediately preceding the channel. PriceWizard is a set of neural networks through which current corporate fundamental data is processed each month to find any stock's intrinsic price. This is best used as a stock-screening tool as stocks which are undervalued with price increasing and valuation increasing usually offer the best advantage. The chart below provides a good example of how PriceWizard can also help identify when price moves too far away from its fair value and forms a bubble. The pink overlays indicate price exhaustion signals. The blue overlays indicate a compression and that a major price move is about to occur. To learn how ExtremeHurst works, we strongly encourage you to watch this narrated presentation: Financial Seismology: Exploiting the Hurst Exponent [276MB .WMV file]. Parallax Financial Research is competitively priced for both retail and institutional traders. Please contact us for a price quote. Want to see a live demo, test drive the software or get a price quote? We also support the Bloomberg Platform.